According to accident statistics, children are safer when properly restrained in the rear seating positions than in the front seating position. Thus, we strongly recommend that children be placed in the rear seats whenever possible. Regardless of seating position, children 12 years old and under must be seated and properly secured in an appropriate infant restraint, toddler restraint, or booster seat recommended for the size and weight of the child. • Your vehicle is equipped with air bag technology designed to deactivate the front passenger front air bag in your vehicle when the system senses the weight of a typical 12-month-old child or less along with the weight of a standard appropriate child restraint on the front passenger seat. • For children larger than the typical 12-month-old child, the front passenger front air bag may or may not be activated. lamp is illuminated, indicating that the front passenger front air bag is deactivated. • A child in a rear-facing child restraint on the front passenger seat will be seriously injured or even killed if the front passenger front air bag inflates in a collision which could occur under some circumstances, even with the air bag technology installed in your vehicle. The only means to completely eliminate this risk is to never place a child in a rear-facing child restraint in the front seat. We therefore strongly recommend that you always place a child in a rear-facing child restraint in a backseat. illuminate or go out while the restraint is installed, please check installation. remains out, do not transport a child on the front passenger seat until the system has been repaired. A child in a rear-facing child restraint on the front passenger seat will be seriously injured or even killed if the front passenger front air bag inflates. • If you have to place a child in a forwardfacing child restraint on the front passenger seat, move the seat as far back as possible, use the proper child restraint recommended for the age, size and weight of the child, and secure child restraint with the vehicle's seat belt according to the child seat manufacturer's instructions. If the child restraint system is not fitted correctly on a suitable seat, it may not fulfil its protective function. In the event of an accident, sharp braking or a sudden change in direction, the child may not be held securely. The child could thus be seriously or even fatally injured. For this reason, when fitting a child restraint system, observe the manufacturer's installation instructions and the correct use of the child restraint system. Child restraint systems should preferably be fitted on the rear seats. The child is generally better protected there. The entire base of the child restraint system must always rest on the seat cushion. Therefore, never place objects, e.g. a cushion, under the child restraint system. Only use child restraint systems with the original cover designed for them. Only replace damaged covers with genuine covers. We recommend that you use the child restraint systems which have been recommended for Mercedes-Benz. Infants and small children should never share a seat belt with another occupant. In the event of an accident, they could be crushed between the occupant and seat belt. Children that are too large for a child restraint must travel in seats using normal seat belts. Position the shoulder belt across the chest and shoulder, not face or neck. A booster seat may be necessary to achieve proper seat belt positioning for children over 41 lb (18 kg) until they reach a height where a lap-shoulder belt fits properly without a booster. When the child restraint is not in use, remove it from the vehicle or secure it with the seat belt to prevent the child restraint from becoming a projectile in the event of an accident. • injure themselves on parts of the vehicle • be seriously or fatally injured through excessive exposure to extreme heat or cold • injure themselves or cause an accident with vehicle equipment that can be operated even if the SmartKey is removed from the ignition lock or removed from the vehicle, such as seat adjustment, steering wheel adjustment, or the memory function If children open a door, they could injure other persons or get out of the vehicle and injure themselves or be injured by following traffic. Further information on secure stowage of loads can be found under "Loading guidelines". If an infant or child is traveling in the vehicle: • Secure the child with a child or infant seat restraint system appropriate to the age and weight of the child. • Make sure that the infant or child is properly secured at all times while the vehicle is in motion. Mercedes-Benz recommends that you always properly secure all infants and children with a child or infant seat restraint system for the trip. Infants and children must always be seated in an appropriate infant or child restraint system recommended for the size and weight of the child. The infant or child restraint system must be properly secured in accordance with the manufacturer's instructions. An information label on the child restraint system indicates whether it meets these standards. This information is also provided in the installation instructions supplied with the child restraint system. Always read and follow the manufacturer's instructions when using an infant or child restraint system or booster seat. Observe the warning labels in the vehicle interior or on the infant or child restraint. If you release the seat belt when driving, the special seat belt retractor is deactivated. The released seat belt cannot be engaged again while driving, because the inertia reel pulls in the seat belt a small distance. The child restraint system is no longer properly secured. There is an increased risk of serious injury or even fatal injury. Always keep the seat belt of the activated special seat belt retractor engaged when driving. All seat belts except the driver's seat belt are equipped with a special seat belt retractor. When activated, the special seat belt retractor ensures that the seat belt will not slacken once the child restraint system has been secured. ■ Always comply with the manufacturer's installation instructions. ■ Pull the seat belt smoothly from the seat belt retractor. ■ Engage the seat belt tongue in the belt buckle. Activating the special seat belt retractor: ■ Pull the seat belt out fully and let the seat belt retractor retract it again. While the seat belt is retracting, you should hear a ratcheting sound. The special seat belt retractor is activated. ■ Push down on the child restraint system to take up any slack. Removing a child restraint system/ deactivating the special seat belt retractor: ■ Always comply with the manufacturer's installation instructions. ■ Press the seat belt release button and guide the belt tongue to the belt outlet. The special seat belt retractor is deactivated. Position shoulder belt across the chest and shoulder, not face or neck. A booster seat may be necessary to achieve proper seat belt positioning for children over 41 lb (18 kg) until they reach a height where a lap/shoulder belt fits properly without a booster. Install the child restraint system in accordance with the manufacturer's instructions. Attach the child restraint system to both securing rings. An incorrectly installed child restraint system could come loose during an accident and seriously or even fatally injure the child. Child restraint systems or child seat securing rings that are malfunctioning or damaged as the result of a collision must be replaced. Securing rings for the third row of seats Securing rings 1 and 2 for two LATCH-type (ISOFIX) child restraint systems can be found on the left and right: Ron the rear seat backrests of the outer seats in the second row Ron the backrests of the seats in the third row of seats Before installing a LATCH-type (ISOFIX) child restraint system in the second row: ■ Move the rear seat backrests in the second row to an upright position . ■ Install the LATCH-type (ISOFIX) child seat securing system. Comply with the manufacturer's instructions when installing. Secure child restraint systems without a LATCH-type (ISOFIX) child seat securing system using the seat belts in the vehicle. When installing child restraint systems, you must observe the manufacturer's installation instructions. Always lock the rear seat backrests in their upright position when the rear seats are occupied by passengers. Lock the rear seat backrests in their upright position before installing the Top Tether straps or when the cargo compartment is not in use. Make sure that rear seat backrests are secured properly by pushing and pulling on the seat backrests. If the seat backrest is not locked properly, the seat backrest could fold forward. The child restraint system is no longer supported properly or held in position and can no longer fulfill its function. This could cause serious or even fatal injuries. Top Tether provides an additional connection between a child restraint system, secured with a LATCH-type (ISOFIX) child seat mount, and the rear seat. This helps reduce the risk of injury even further. The Top Tether anchorages for the second row of seats are located on the rear of the rear seat backrests. 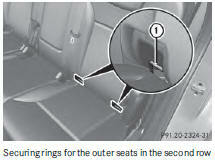 For the third row of seats, use the cargo tie-down rings in the cargo compartment floor. ■ Move head restraint 3 upwards. ■ Install the LATCH-type (ISOFIX) child restraint system with Top Tether. Comply with the manufacturer's installation instructions when doing so. ■ Route Top Tether belt 6 under head restraint 3 between the two head restraint bars. ■ Guide Top Tether belt 6 downwards between cargo compartment cover 1 and rear seat backrest 2. ■ Hook Top Tether hook A of Top Tether belt 6 into Top Tether anchorage 4. • Top Tether hook A is hooked into Top Tether anchorage 4 as shown. • Top Tether belt 6 is not twisted. • Top Tether belt 6 is routed between rear seat backrest 2 and cargo compartment cover 1 if cargo compartment cover is installed. • Top Tether belt 6 is routed between the rear seat backrest 2 and the cargo net if the cargo net is installed. ■ Tension Top Tether belt 6. Comply with the manufacturer's installation instructions when doing so. ■ Move head restraint 3 back down again slightly if necessary . Make sure that you do not interfere with the correct routing of Top Tether belt 6.